Forget the 100-mile eat-local diet; try the 300-square-foot-diet; grow squash on the windowsill, flowers in the planter box, or corn in a parking strip. Apartment Gardening details how to start a garden in the heart of the city. From building a window box to planting seeds in jars on the counter, every space is plantable, and this book reveals that the DIY future is now by providing hands-on, accessible advice. 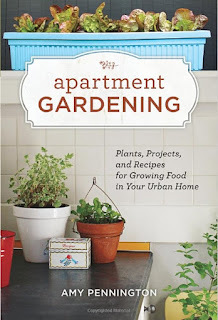 Amy Pennington's friendly voice paired with Kate Bingham-Burt's crafty illustrations make greener living an accessible reality, even if readers have only a few hundred square feet and two windowsills. Save money by planting the same things available at the grocery store, and create an eccentric garden right in the heart of any living space. 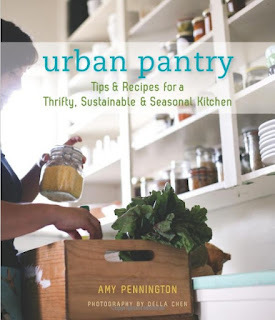 Urban Pantry is a smart, concise guide to creating a full and delicious larder in your own home. It covers kitchen essentials, like what basics to keep on hand for quick, tasty meals without a trip to the store, and features recipes that adapt old-fashioned pantry cooking for a modern audience. Avid chef and gardener Amy Pennington demystifies canning and pickling for the urban kitchen and provides tips for growing a practical food garden in even the smallest of spaces. Her more than sixty creative recipes blend both gourmet and classic flavors while keeping economy in mind. Urban Pantry holds sustainability at its center: Take advantage of local ingredients, eliminate wasteful kitchen practices, and make the most out of the food you buy or grow. Food enthusiast Amy Pennington is the creator and owner of GoGo Green Garden, an edible gardening business wherein she builds, plants and tends edible gardens for city folk in their backyards. In March of 2009 Amy launched UrbanGardenShare.org, a garden website that pairs city gardeners with unused garden space via an online matching site. She has been featured on Whole Living Martha Stewart Sirius Radio and in national and international publications including Sunset magazine and the Toronto Star. Amy is a regular contributing writer to Edible Seattle, a bi-monthly food-focused magazine highlighting the culinary bounty of the Puget Sound region and is a guest contributor on the weekly radio program In the Kitchen with Tom & Thierry. She lives in Seattle. Visit GoGoGreenGarden.com to learn more. I will have to gab em and read, thanks!